In San Francisco last summer, Lois Steinberg analyzed Virabhadrasana II for a long time. Most students attending the five-day workshop were teachers or experienced students. But Warrior II was nevertheless a worthy challenge. Using an adept student as a demo model, she emphasized how the bent knee must rotate outward to elongate the groins and adductors. If the knee is falling inward, the pose is not only misguided but also difficult to hold. Lois gave us a look, firm, knowing, unblinking. She would be a formidable opponent in a staredown. All the while, the demo student kept still as a statue, seemingly oblivious to her audience. A light bulb went off in my head. Some years ago, I studied with Donald Moyer and Mary Lou Weprin at their weeklong summer intensive at The Yoga Room in Berkeley. Donald often used student demos to illustrate subtle points. During a demo, I would listen to Donald cue a student, perhaps on balancing the “three diaphragms”: the respiratory diaphragm, plus two other membranes at the pelvic floor and at the thoracic inlet. He would guide the student to align the diaphragms relative to one another—and also to assess the quality of each: Broad versus narrow? Too tight, too loose? I would listen carefully—his meticulous instructions require rapt attention—yet I would get distracted by the student’s bent wrists or pronated back foot. It’s not that I didn’t appreciate Donald’s diaphragms, which he explicates in his singular, aptly titled book Awakening the Inner Body. But, by letting myself be preoccupied with other “errors,” I was neither fully present nor seeing beyond the outer body. Donald and Mary Lou are two of my original teachers. 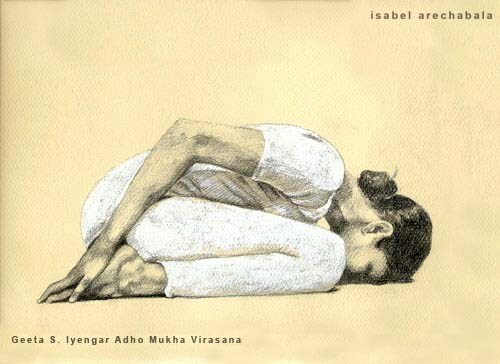 I discovered Iyengar yoga and Yoga Room in the late 1990s while living in Berkeley. During those early years I was being taught asana with a particular ethos—to work from firsthand experience, from the inside—but I didn’t quite realize it. The Yoga Room ethos paralleled that of Berkeley (or at least the idea of Berkeley): antiestablishment, freethinking, intellectual, a bit quirky. When it was mainstream to “tuck the pelvis,” Donald made the Yoga Room a “no tucking zone.” While it’s common to instruct to “pull the shoulder blades down” when arms are overhead, Mary Lou pointed out the anatomical impossibility of such an action. My own skeptical nature might have taken root there and then—although at the time I was rather conventional and impressionable. Lois’s statement about “missing the point” resonated with me. I was reminded of Donald’s guiding students inward, of my yoga roots, and of my journey from then to now. Note: During that class, Lois taught an interesting, invigorating sequence. She started with chair twists and deep Dwi Pada Viparita Dandasana backbends. Next were inversions, Parsva Sirsasana and Adho Mukha Vrksasana. We then did a bunch of standing poses, including the aforementioned Vir II. Finally we did Anantasana, a long Sarvangasana series, and pranayama. 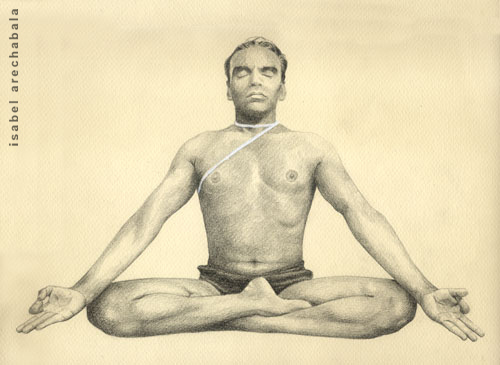 While BKS Iyengar includes many uncommon sequences in the back of Light On Yoga, many teachers typically do standing poses first and backbends and inversions later. Lois’s sequence was a refreshing change—and it was effective. 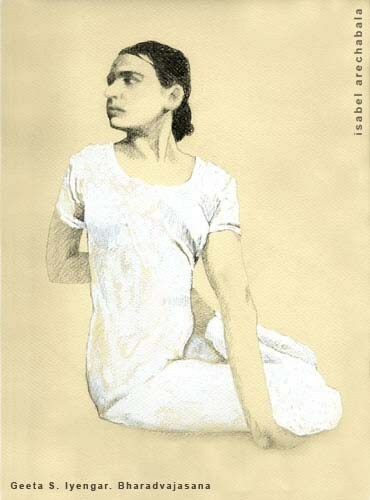 I wonder if Lois was referring to the photo (of a young Geeta) above that I found on Michael Romero’s Home Yoga Practice blog. 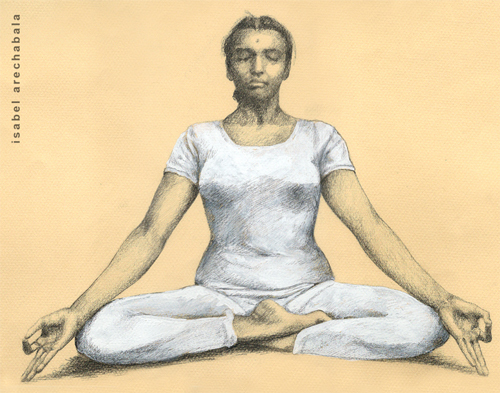 In his post “Why this is a perfect Virabhadrasana II,” he concisely analyzes Geeta’s pose. Thank you Luci. Really interesting post. I studied with a teacher in Amherst MA who calls her approach embody-yoga and it’s internally based. Much resonation with what you describe and food for thought about sequencing, alignment, and inner body. I’ll check out Donald Moyer’s book. Thanks for your comment, Tom. On Amazon, Awakening the Inner Body is US$23.66 and CA$37.61, although the price differential is small if the exchange rate is applied. Thanks to the struggling Canadian dollar, publishers won’t stop jacking up book prices here any time soon! Thank you for linking my blog to this wonderful article. I will be going up for my Junior I assessment in September (again). Hope you are well Luci! When I Google searched for pics of Geeta in Virabhadrasana II, your blog post popped up. Where is this photo published? Although familiar to my eye, I cannot quite cite it. Here’s to a fruitful run-up to your September assessment. In my jam-packed mental file cabinets, I have a blog-post series on my assessments. Will they ever get written? My blogging regularity is currently hindered by “the rest of my life”! I first saw the photo on my FB feed. I believe it was from IYNAUS and was reposted in several national associations’ FB feeds throughout the world. That was by far my most viewed post. I hope I can pass my assessment in Sept. I am a bit off my axis from all of my commitments. Always nice to read your blog posts, Luci. I hope your family is well on the Big Island too; those lava videos are very scary. I saw the picture and was instantly reminded of Michael’s post! I remember reading somewhere that the picture was most probably taken on the terrace at RIMYI. Not 100% sure but will confirm if I can verify it. Thank you for another lovely post.